Heat the salt, chili powder, and pepper flakes in a small dry skillet over medium heat, stirring until hot and aromatic, about 3 minutes. Remove from the heat and crumble in the oregano. Boil the edamame pods in salted water until tender, about 8 minutes. Drain in a colander and pat dry. 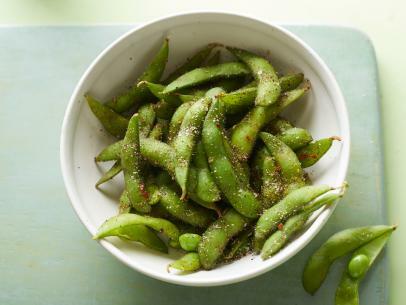 Toss the edamame pods with the chili-salt and serve warm.